On Sunday, it will be October 10th, 2010, or 10/10/10. The geek in me couldn’t let 101010 go by without a special post. Since I don’t post on Sundays usually, I made my Tuesday post: Plus or Minus 10 Years. This marked 3 firsts for me. It was my first Linky and the first post I created a button for. Most significantly, though, it was the first time I really apologized (in a public fashion) for something stupid I did when B and I were engaged. You’ll have to read my post to see what it was. (Hey, you didn’t expect me to just tell you, now did you?) Needless to say, I thought I was doing the right thing at the time but hindsight (being 20/20 and all) has shown me how wrong I was. 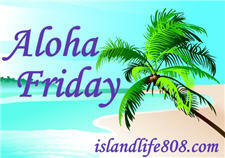 Thus, my Aloha Friday question for today is: Have you ever done something that affected a loved one that you thought was the right thing at the time only to realize later was the wrong action? After you answer my Aloha Friday question, stop by my LuLu.com Photo Book giveaway and B’s CardsDirect $50 gift card giveaway. oh yes, many times. Maybe one day I would share, but I really do not think reliving it helps me or my family move one. Now that I think about it, I think I blogged about a bowling thing with my brother in the 1960. He still has trouble with that one,lol. I, like you, can not let the date go by with a post. I, like you, do not post on Sundays. Like you, I will program A post on one, or maybe just all of my blogs. Thinking of a Dessert to honor the day 101010. Or maybe even a garden sign to bring in that perfect day. What more prefect for it to arrive on Sunday! Thinking that we are doing the right thing and then second guessing it forever is really what parenting is all about. Probably. Haven’t we all at some time or another. We are human after all. I’m sure I’ve done that with my children, but can’t think of anything specific. yes! it was something with my son and I so regretted it! !